Disney's smash-hit musical plays at the Prince Edward Theatre, starring Jade Ewen and Trevor Dion Nicholas. Based on the classic Disney animation, Aladdin is the family favourite musical packed with colour and spectacular songs! With music by Alan Menken and lyrics by Howard Ashman and Tim Rice, Aladdin features the well-known songs such as "One Jump Ahead", "Friend Like Me", "Prince Ali" and the award-winning "A Whole New World". 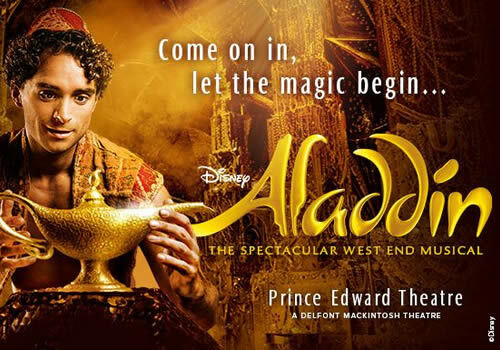 Directed and choreographed by Casey Nicholaw (Dreamgirls, The Book of Mormon), Aladdin continues to wow West End audiences. 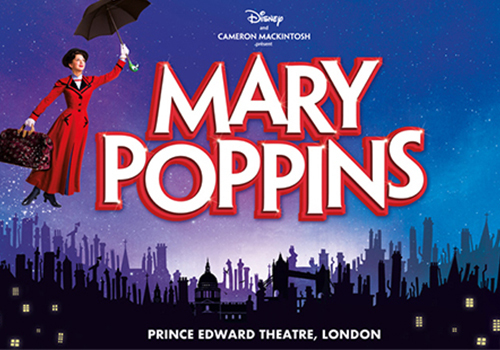 The magical Mary Poppins returns to the West End in Autumn 2019, ready to delight and amaze audiences. The show features the classic songs by the Sherman Brothers from the film and stars Zizi Strallen and Charlie Stemp as Mary Poppins and Bert. The Prince Edward Theatre’s box office is located within the theatre building on Old Compton Street and is open Monday- Saturday from 10am - 7.45pm. Pre-purchased tickets can be arranged for collection at the theatre’s box office within the hour before the show starts. If you plan to collect your ticket you will need the card you used to make your purchase along with your booking reference. Originally built in 1930, the Prince Edward Theatre opened with a performance of the energetic musical Rio Rita. As early as 1935, the theatre was converted into a cabaret hall and renamed the London Casino. The venue continued in this guise until it was damaged during World War II. 1942 saw the venue become the Queensberry All Services Club, where shows would be broadcast for the BBC. Following this, the building was reverted back to a casino in 1954, including a Cinerama. Films shown included the premieres of Search for Paradise (1961) and How the West Was Won (1962). In 1969, the venue premiered Ben-Hur, which continued until 1970. In 1978, the venue reopened as the Prince Edward Theatre, with the world premiere of Andrew Lloyd Webber musical Evita, starring Elaine Paige and David Essex. Evita ran for eight years before being replaced with Tim Rice musical Chess, which also starred Elaine Paige. Elaine Paige also took to the stage in Anything Goes (1989-1990), with subsequent productions at the venue including Children of Eden (1991), The Hunting of the Snark (1991), Some Like It Hot (1992), starring Tommy Steele, Crazy for You (1993-1996), starring Ruthie Henshall, and Martin Guerre (1996-1998). Further productions included Show Boat (1998) and West Side Story (1998-1999). Mamma Mia! received its West End debut at the Prince Edward Theatre, opening in 1999 and continuing until 2004, before transferring to the Prince of Wales Theatre. This was followed by Mary Poppins (2004-2008) and the West End premiere of Broadway’s Jersey Boys, which ran from 2008 to 2014, before transferring to the Piccadilly Theatre. In 2014, the Prince Edward Theatre became the home of Cameron Mackintosh’s revival of Miss Saigon, starring newcomer Eva Noblezada. The show continued until 2016, when Broadway’s glittering musical Aladdin made its way into the theatre. Aladdin - Disney's New Musical plays at the theatre until June 2019, where it will be followed by the return of Mary Poppins in the autumn. Zizi Strallen and Charlie Stemp will star as Mary and Bert.